Share the post "DIY Decorated Flower Pots"
Feel free to make changes in the given ideas and decorating the pots. These are just tips that should help you in the steps of production and that will awaken your creativity. Good luck! Choose a ceramic pot and prepare the ceramic pigments; buy them in the form of powder and later prepare them by putting them in water. There are numerous ceramic pigments and you can mix two or more to get the desired shadow. For this purpose, you’ll need to dissolve a single pigment in a bowl. Dip half of the ceramic pot in the bowl and hold for 2 minutes (or longer, if you want a darker shade). Remove the pot, dip in the pot again but this time lower and hold for 20 seconds. Repeat the step by keeping the pot in the color only for 5 seconds. Let dry and voilà! 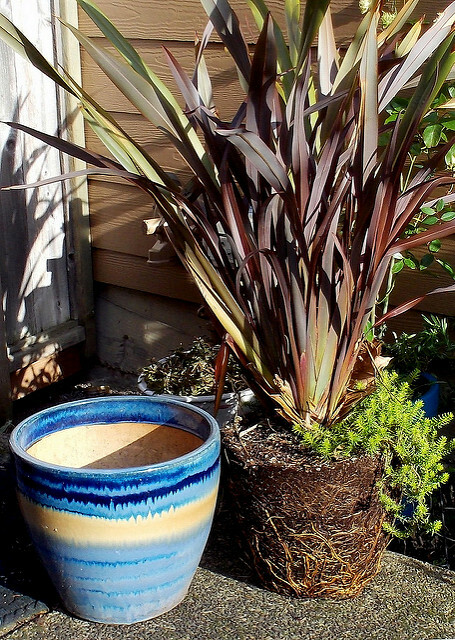 Your first DIY pot is ready for a new plant. If possible, use white ceramic pots to get beautiful shades of the used color. To make these interesting pots, you’ll need copper wire (take as much as you think you’ll use to wrap the entire pot) and miniature satin ribbons. When making or buying the ribbons, choose the color you prefer (if you’re not sure which color you want, we suggest you to combine leek-green shade with the natural color of copper; it will look unique and sophisticated)! Take the pot and carefully wrap the wire around it by making concentric circles. Be careful not to leave a space between the coiled wire. If you don’t have precise hand or patience, ask someone to help you (don’t be ashamed, not every one of us is willing to devote their nerves to this).  To strengthen the wire, affix the start and the end of the same, before starting the winding and after making the last circle. Apply glue in several places and fix the ribbons to the copper wire. You can circle the ribbons around the central part of the pot or arrange them diagonally. This is the easiest way of decorating pots. Choose colors, shades and release the artist hidden in your soul. Draw patterns or entire applications on the pots and color them. Enjoy your time!